If you're looking at a new car purchase in the near future, you should be doing a lot of research about different vehicles out there. Depending on what you're looking at, you might notice multiple prices for the same car. For example, a TV commercial may advertise a 2018 Lexus IS 300 differently than the price you might see on a website. This might be confusing, but the reasoning is pretty simple. Many outlets will only show you the MSRP of the car (Manufacturer's Suggested Retail Price). This is set by the Manufacturer, for example, Lexus, as a recommended sale price, and is the only one that an outlet legally has to show. 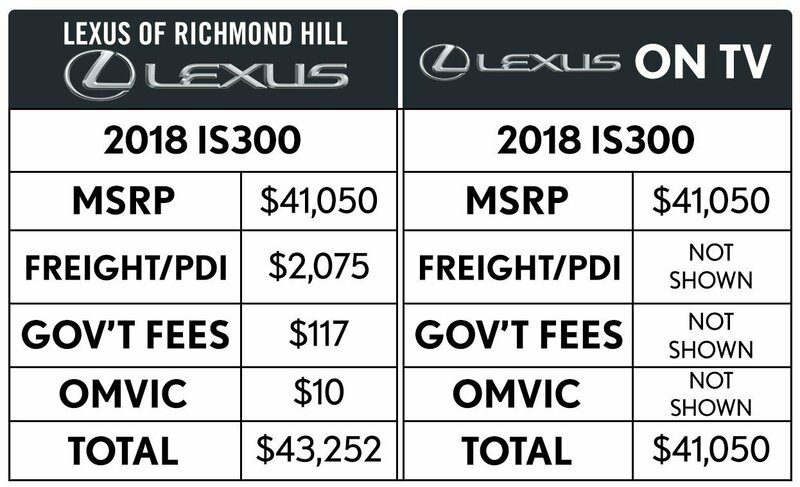 However, at Lexus of Richmond Hill, we want to be upfront about our prices, which is why we include all fees in our pricing. In Ontario, all dealerships must advertise their prices according to OMVIC (Ontario Motor Vehicle Industry Council) regulations. One of those regulations is, we must advertise the "All-In Price", which is MSRP (Manufacturers Suggested Retailing Price) plus all applicable fees and levies such as Freight & PDI, the Environment Handling Fee, OMVIC Fees and Tire Levies. Not all advertising complies with this regulation, and sometimes you will just see MSRP Advertised. All dealerships will charge the "All-In Price", but you might not know that until you're sitting at the negotiation table. At Lexus of Richmond Hill, it is our policy to be upfront, honest and clear about our pricing. See the graphic above for a complete breakdown of pricing. Can I purchase a Lexus vehicle directly from the manufacturer or distributor? No. All retail sales transactions of Lexus vehicles are processed directly through Lexus dealerships in Canada, so you must contact a Toyota dealer. Lexus Canada is the distributor of new Lexus vehicles in Canada and is responsible for the warranties of these vehicles. Canadian Black Book is a highly regarded and extensively used independent third party organization, specializing in the valuation of used automobiles in Canada. Toyota is pleased to present you with this third party data as a reference in estimating the value of your current vehicle. The actual cash value of a trade-in vehicle can only be determined through an appraisal at a participating Toyota dealership. MSRP is an acronym that stands for manufacturer's suggested retail price. Manufacturers (i.e. Audi) use MSRP as a base price to give retailers their estimated value of a product. This is not the usually the actual price of an item, but rather what the manufacturer suggests as the maximum price that the item could be expected to sell for. Dealers, are free to offer the vehicle for a lesser price, but never more on a new retail vehicle. MSRP generally does not include additional trim levels, options, accessories, Freight, PDI, administration fees, or taxes. Buying a used vehicle can be a very stressful experience. In any situation where you're spending so much money, you want to be sure you have all the information available on what you are buying to make the best decision you can. You don't want to go on just what you've been told - you want impartial, thorough, accurate, and timely data. As well, not only do CarProof reports protect your wallet, but most importantly, having this information helps protect your family from the possibility of purchasing a vehicle that could be unsafe. Does Lexus provide assistance for importing Lexus vehicles to Canada? The MSRP and rates used above are approximate and used only as an example. Please see your Dealer for current finance and lease rates. *Taxes (GST & PST) are 13% in this example. "Afford" a nicer car. If you've ever wondered how it is that so many people can afford to drive an RX or IS, then wonder no more. According to LeaseGuide.com, around 75% of all luxury cars are leased. The reason is because banks don't like to loan out more than $30,000 for a car loan. If you want a car that's worth more than that and you don't have the money to make up the difference, leasing is your only option. On the upside, your monthly payment will be lower than if you actually bought a car. Leasing allows you to "afford" a nicer car than you'd get if you had to buy it. What is the difference between an open or closed end lease? Are leased cars covered by Lemon Laws? What if I've decided to buy, not lease? Which cars make the best lease deals? 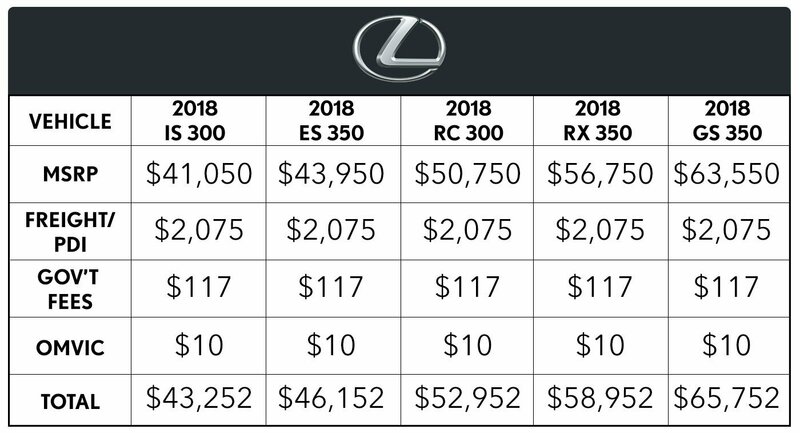 This will vary by manufacturer but the bets are the brands with higher resale values( Toyota and Lexus are good examples). They provide good value any time. Where can genuine Lexus parts be purchased? Genuine Lexus parts and accessories are sold through our Parts Department. Our Parts Personnel can determine the availability and price of the parts and accessories required, and can assist in the processing of your order. Always use Snow Tires when driving on snow or ice. Select snow tires of the same size, construction and load capacity as the original equipment tires. All four tires must be the same brand and have the same tread patterns. Observe these precautions to help prevent accidents. Failure to do so may cause damage to parts of the drive train, as well as dangerous handling characteristics, which may lead to injury or fatal accidents. Are genuine Lexus oil filters better for my Lexus? There may be differences between genuine Lexus filters and aftermarket filters. Genuine Lexus filters are designed and engineered to fit Lexus vehicles specifically and to maintain the filtration of dirt or particles within the oil to match the recommended oil change interval of 8000 km. Aftermarket filters may not have the same fit or be manufactured to the same standards as genuine Lexus filters and may cause engine concerns. No. Non-Genuine Lexus Parts, or any damage or failures resulting from their use, are not covered by any Lexus warranty. Only Genuine Lexus Parts and Accessories are covered by the Lexus Replacement Parts and Accessories Warranties. Where do I find information on the services required to maintain a Lexus vehicle? Lexus Guests can find information on vehicle maintenance in the Owner's Manual Supplement. You may also access an online schedule in our Maintenance section. What are some common reasons why the BRAKE indicator light is illuminated? The light will also be on if the brake fluid is slightly lower than allowed. That is usually an indication that the brake pads are worn and need service soon. The worst-case scenario is that the brake system is leaking fluid, which could lead to hydraulic failure resulting in no braking power. The driver would feel the brake pedal become spongy, and braking power required would steadily decrease or become more difficult. The driver should not drive the vehicle in this situation. The vehicle should be towed and repaired. Additional diagnostics that may be performed by the dealer include: parking brake adjustment, parking brake warning switch, parking brake warning switch wiring harness and connected components, brake fluid-level warning switch, brake fluid-level warning switch wiring harness and connected components. Does the Owner's Manual state the minimum required maintenance for my Lexus? Maintaining your Lexus vehicle according to the recommendations in the Warranty and Services Guide Scheduled Maintenance Log is required to ensure that your warranty coverage remains intact. Your Lexus dealer may recommend more frequent maintenance intervals or more maintenance services than those listed in the Warranty and Services Guide. These additional services are not required to maintain your warranty coverage. Please ask your dealer for an explanation of any recommended maintenance not included in the Scheduled Maintenance Log. How important is a tire's treadwear rating? When choosing a new set of tires, the treadwear rating offers no guarantee of the mileage a customer will get. Weather, driving habits, road conditions, alignment and tire maintenance all affect tread life. The treadwear rating merely lets a customer compare the potential life of different tires. Also, these ratings may be interpreted differently by different tire manufacturers. Refer to the appropriate Warranty and Services Guide for specific tire manufacturer limited warranty. A maintenance-free battery is designed to capture and return evaporated fluids to the battery reservoir. Water may not be added because the battery cells are sealed closed. Can I use synthetic engine oil in my Lexus vehicle during its break-in period? Synthetic oil can be used at the first scheduled oil change. Please note that some models have specific synthetic oil specifications, and the use of synthetic oil does not extend the recommended oil change intervals. Please refer to the Lexus Warranty and Services Guide for further information regarding the proper maintenance schedule for your specific vehicle. If synthetic oil is used after that time, it should be the same SAE (Society of Automotive Engineers) weight specification and meet or exceed the API (American Petroleum Institute) grade specifications listed in the Owner's Manual. Even if synthetic oil is used, we do not recommend longer oil change intervals. Once synthetic oil is used, it is best not to switch back to petroleum-based oil. What precautions do I need to take during the break-in period for my new Lexus? A few simple tips for the first 1,600 km can add to the future economy and long life of your new Lexus. These tips can be found in your Owner's Manual. Refer to the index for the exact page location. What is the Vehicle Identification Number? The Vehicle Identification Number, or VIN, is a sequence of 17 alphanumeric characters used to uniquely identify your vehicle. The VIN on vehicles purchased prior to 1992 may consist of fewer digits. Toyota VINs beginning with "2" indicate vehicles assembled in Canada. Vehicles with VINs beginning with "1", "4", or "5" represent vehicles assembled in the United States. Vehicles with VINs beginning with "J" were produced in Japan. The 2nd digit indicates the Manufacturer, which is Toyota. The next 6 digits (3 through 8) are the Vehicle Description Section (VDS). These provide information on the vehicle, engine, model and body style. The ninth digit is a check digit used internally. The 10th digit indicates the model year. Letters (except "O" and "Z") were used for vehicles up to the 2000 model year, while numbers are used for 2001 and newer vehicles. For example, "X" means the 1999 model year, "Y" is the 2000 model year and "1" represents the 2001 model year. The 11th digit is the plant code. Finally, digits 12 - 17 are the unique vehicle serial number. The letter "O" is never used in a VIN. "0" always refers to the number zero. What should be done to a Lexus vehicle to prepare it for long-term storage? Before storing car: Change engine oil, change coolant if due during time of expected length storage, fill up fuel tank, wash vehicle using high-pressure water or steam to clean underneath. Rub the leather seat surfaces with an approved cleaner and allow dry in a ventilated, shaded area. Check underneath floor mats  ensure carpet is dry. If there are any paint chips, have them repaired. (Customer should be aware that Lexus recommends operating A/C compressor once month proper lubrication. stored for long time, it could detrimental compressor.) When Operate at normal temperature 15 minutes prior shutting off engine. Disconnect negative battery cable. (If applicable, radio ddc-radio may lock up.) Leave parking brake off. Put on blocks. temperate, ventilated garage, windows can left cracked slightly open. Cover vehicle. bringing out storage: Charge reconnect add underhood fluid levels as needed. inflate tires correct pressures before taking After starting engine, observe warning lights. remain illuminated, issue addressed by dealer appropriate. pedal feel (height firmness) shifting transmission. Take general inspection. How do I clean the interior and exterior of my Lexus? Remove dirt and dust using a vacuum cleaner. Wipe dirty surfaces with a soft cloth damp with warm water. When cleaning carpet and cloth interior, remove dirt and dust using a vacuum cleaner. Apply a foaming-type carpet cleaner with sponge or bruish, allowing cleaner to work for a few minutes to loosen dirt. Continue by rubbing carpet and cloth interior in a circular motion. Wipe off excess with a clean cloth. If any dirt remains, repeat process. Best results are obtained by keeping carpet and cloth interior as dry as possible. When cleaning leather, remove dirt and dust using a vacuum cleaner. Using a small amount of neutral wood detergent mixed in water, apply to leather using a sponge, rubbing in a circular motion. Wipe off excess detergent and let leather dry in an open air location. Working from top to bottom, apply lots of low pressure water to vehicle body, wheel wells and underside of the vehicle to remove any dirt or dust. Wash tehj vehicle body using a soft sponge or soft cotton cloth with mild car wash soap. Rinse off with water. Wax vehicle paint if water does not bead on a clean vehicle surface. Using a soft cotton cloth, apply car wax when the vehicle body is cool. Wait for hot wheels to cool before getting wheels wet. Using a soft sponge or soft cotton cloth, apply same mild car wash soap as used for the paint. Quickly rinse off soap with water. Using a soft cotton cloth, apply car wax as used for the paint. Can a customer obtain a replacement VIN plate? If the customer has a full VIN plate to turn into the Lexus dealer, the Lexus dealer may submit a replacement application and the damaged VIN plate to Lexus Technical Compliance. The existing VIN plate must be complete and legible in order for Lexus to review the application. Lexus Technical Compliance will not provide a replacement VIN plate if the existing VIN plate is not legible or if the VIN is partially or fully missing. How do I check Bluetooth Phone Capability? This video shows you how to check phone compatibility at www.lexus.com/mobilelink, pair a compatible phone, and place hands-free calls. This video applies to 2013 models equipped with navigation, except GX. ES with remote touch controller is shown, IS and LX with touch screen operate similarly. How do I program my garage door opener? This video shows you how to program compatible garage door openers and remote-control entry gates. ES shown, other models similar. How to use All-Speed Dynamic Cruise Control? This video shows you how to use All-Speed Dynamic Cruise Control, available on 2013 LS. If your 2013 LS has the vehicle-to-vehicle distance button on the steering wheel, your vehicle has this feature. How to use and adjust the Remote Touch? For models equipped with Navigation and Remote Touch Controller, this video shows you how to use and adjust the Remote Touch, which controls the navigation system, audio system, climate controls, and Bluetooth® features.